Elynor Gilbert writes to Government Minister to demand local referendum to "this monstrously expensive and quite unnecessary Management Plan"
"I have written to Grant Shapps the Minister leading on local government (at the Department of Communications and Local Government), to see if he can solve the case of greedy Natural England wanting to take over all commons and, if possible, fence the lot so as to impose grazing cattle. "That will destroy our ability to access green spaces without hindrance and cause noise pollution in an otherwise tranquil corner of southern England when they build all those cattle grids at all accesses to the Common. 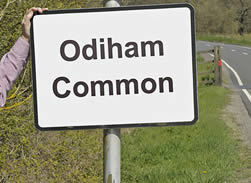 At one time, they called for four extra ones to the existing one off the Odiham by-pass. Cost?! "The original idea was to permit cattle to roam freely at certain times of the year over all the surrounding roads including the one to the Station !! "These are farcical propositions but are being accepted by the local "representatives" of our community who have their own axes to grind. "I have asked Shapps for a referendum to be added to local council elections this May to ensure that Odiham-ites have a chance to object to this monstrously expensive and quite unnecessary Management Plan. No pleasant rides, no dogs off leads, no safe picnics; they are determined to ruin our Common for all of its human users. "What remains shocking to me is the amount of dishonesty on government's side over the handling of this affair, covering now an unbelievable 18 years, since the Common received its SSSI status in 1992. This Plan is an open door to abuse of our freedom to enjoy the countryside."